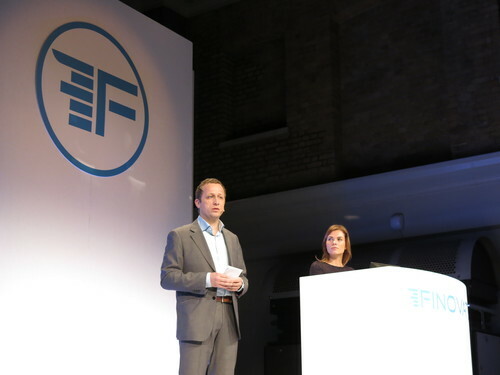 MyOrder CTO Gertjan Rösken and Tamar Klein, sales manager, demonstrated MyOrder and MyOrder Sidekick at FinovateEurope 2014 in London. Other examples of joint ventures between MyOrder and Wirecard Group include the contactless mobile cards using host card emulation (HCE) technology the two issued last summer. Wirecard EVP for Telecommunications Christian von Hammel-Bonten called MyOrder a “strong and innovative partner” and praised the company’s technology as an example of how to “flexibly and easily” add cloud-based payments to any mobile app using their HCE SDK. 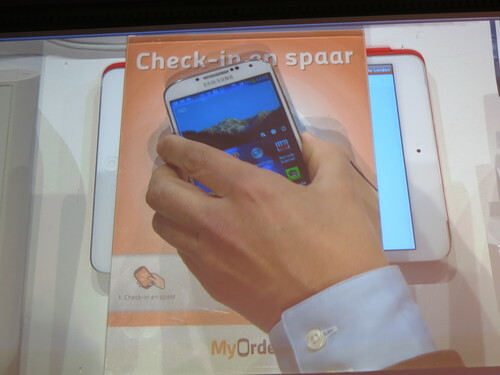 Founded in 2008 and headquartered in Groningen, Netherlands, MyOrder was acquired by Rabobank in 2012. The company demonstrated its technology at FinovateEurope 2014, and that summer announced that it was teaming up with PayPal to support advanced order and payment for food and drinks at Dutch cafes and restaurants. In January, MyOrder was the first company to offer a parking app on the Apple Watch and this spring MyOrder became an option for Dutch motorists at 220 Tamoil gas stations who will be able to order and pay for their refueling in advance using their mobile device. The app also provides drivers with information about their fuel consumption and driving habits. InComm adds new brands to its Incentives e-commerce site, including vacation brands. Green Dot opens subsidiary in Shanghai. Citizens 1st National Bank introduces mobile remote deposit capture with integration of Malauzai SmartApp, Ensenta mRDC. Liz Loewy, senior vice president for EverSafe, spoke about elder financial abuse at White House Conference on Aging. Arxan Technologies partners with Sequent to develop new security solution to protect HCE-based payment systems. Five Degrees appoints Peter-Jan van de Venn as new chief commercial officer. BBVA Group inks strategic agreement with the Alliance for Financial Inclusion. Business Insider names executives of Braintree, PayPal, Coinbase, and Venmo as 5 of 10 execs who are transforming the fintech industry. Kotak Securities and Heckyl launch real-time news and market-info apps. Cachet Financial Solutions to deploy Select Mobile Money platform for SOLE Financial’s Visa Paycard. TIO Networks to acquire Softgate Systems. MyOrder teams up with WirecardGroup to issue contactless mobile cards using HCE technology. Algomi wins “FinTech Innovation of the Year” honors at 2015 Euromoney Global Awards for Excellence. Wealthfront lowers its minimum investment to $500. Bank Innovation takes a look at how startups like SizeUp help banks work better with small businesses. Authentication specialist BioCatch earns a pair of patents from the U.S. Patent Office. Mobile payments-loving Dutch citizens have something to celebrate today. PayPal announced last week that it is now accepted at 1500 brick and mortar stores in the Netherlands. Patrons of those stores will be able to pay with PayPal at parking meters, cafes, restaurants, and more. For PayPal, this expansion into mobile payments is no surprise. Last year, the dollar value of transactions made from a smartphone or tablet was $27 billion, which is an increase of 99% from one year prior. Check out a live demo of MyOrder’s technology from FinovateEurope 2014. PayPal last demonstrated at FinovateEurope 2012 where it showcased Instant Account Creation. PayPal announces partnership with MyOrder to enable PayPal payments at 1,500 locations in the Netherlands. SecureKey launches new single-stack API integrations for card-present, card-not-present, and ACH transactions. Concur adds gamification features to TripLink, the company’s spend management solution. Expensify changes report submission and approval process for those using Expensify outside of an expense policy. Concur partners with Airbnb to make it easier for business travelers to file expenses when booking on Airbnb. RazorSocial takes a look at simplifying Google Analytics using Quill Engage from Narrative Science. Financial Guard featured in Investment News’ review of “robo-advisors” and online investment managers. Huffington Post: Pellucid Analytics turns data into content to make lives easier for investment bankers. This post is part of our live coverage of FinovateEurope 2014. Coming to the stage is the team from MyOrder. A week ago we introduced you to half of the companies that will be demoing their technologies on stage for FinovateEurope 2014. Today we’re providing the second half of our scheduled roster for February. For more information, and to get your tickets, visit our Finovate Europe 2014 page here. Luxoft’s iStockTrack is an innovative iPad solution providing mobile banking services for private and premium banking clients. Matchi is an innovative matchmaking platform for banks and innovators to establish collaborative relationships that deliver increased ROI for innovators and banks alike. Meniga is Europe’s leading white-label PFM provider. The company helps banks improve their businesses through data-mining, cross-sales, and improved retention. Mobino enables mobile payments for 5 billion people, from any phone, no credit card required. The Moneyer is the future of online Personal Finance Management. Money on Toast delivers independent and whole of the market, FCA-regulated financial advice online via its algorithm-powered adviser. MyOrder provides a m-commerce mobile app that serves businesses in parking, catering, and entertainment. myWishBoard is the first crowdfunding platform for personal dreams and wishes. NF Innova’s Personal Experience Module, a part of iBanking product suite, enables banks to offer their customers a truly unique and tailored user experience. Nostrum Group has built a virtual collection product that automates and optimizes the delinquency management process. Nous.net’s Spark Feed is a real-time financial data service that helps you understand and predict the markets. payworks is the provider of a mobile POS, Software-as-a-Service platform that lets developers quickly build payment functionality into their shopper and merchant apps. PhotoPay’s technology allows users to extract data from any document, paper or electronic, enabling billpay on mobile devices. Pixeliris’s CopSonic is the first universal contactless mobile payment system powered by our unique technology based on sonic communication. Plutus Software’s KreditAja credit scoring system is designed to better serve the unbanked and underbanked in Asia. SaaS Markets is an enterprise cloud marketplace company whose MarketMaker platform helps FIs deploy their own branded, cloud-based business app store. SmartEngine stands for personalization and target marketing. As pioneers in the field of customer loyalty, Smart Engine is a driver of innovation and a leader in personalized target marketing. SoftWear Finance’s HACU PLATFORM enables banks to provide customers with the best possible user experience on any platform or device. SQLI’s Augmented Banking is a new take at Online Banking. It is aimed at positioning a bank at the very center of people’s digital lives. Temenos’s Treasury Management Dashboard tablet app has been developed for Microsoft Windows 8 and enables the transformation of treasury operations. Tink is a free personal finance service that allows you to follow your money, where ever you are. Tootpay’s solution is a mobile financial solution for payments, banking, telecommunications, and remittance industries. Top Image Systems has leveraged its deep recognition and imaging expertise to develop a powerful suite of image processing applications for mobile devices. Topicus Finan is a software vendor specializing in enterprise-level financial analysis. Its solution enables banks to provide self-service business lending processes for SMEs. Toshl Finance is a personal finance manager made fun. Find out where your money is going, keep on top of bills and spending, and set up budgets. Truphone, the innovative mobile operator, introduces the only global network-based recording solution for the Financial Industry. Trustev provides a new approach to fraud prevention through a real-time, online identity verification platform, which ensures that merchants know exactly who they are selling to. Yseop Sales Force Productivity Suite and its email writing application (YseMail) support financial advisors through the entire sales cycle.